We believe we can create a prosperous future with positive environmental and social effects. For that, we need to adjust our current production model and the way we connect to natural resources on a daily basis. Hence, we can promote quality of life and abundance, without risking our health. We believe in the transition to cities that are healthy and integrated with nature. We understand that the current linear production paradigm, based on the process of “extracting – producing – discarding”, is outdated. We should migrate to a circular economic system. In this new model, the value of resources is kept in circulation through the design of healthy and integrated supply chains. Our proposal is to work towards an intentional design for quality and generation of positive effects for all. Circular design is based on the knowledge that natural systems function in cycles and that we can mimic them in our designs. Understanding these cycles is important to use available resources effectively, using wastes as nutrients for new cycles, employing safe and non-toxic materials when designing our products and houses, and consuming from renewable sources. These adjustments should permeate different scales of production, consumption and disposal, such as the design of industrial systems and products, building our houses and workplaces and developing urban and regional areas. Cradle to Cradle® (C2C) is the basis of our way of acting. It is a design concept that proposes a new way to create and produce quality. The idea is that natural resources are used in a logic of creation and reuse: the beginning of each cycle is a new ‘cradle’ for that resource. If we design or optimize products and systems for biological and technical cycles, we allow materials to be indefinitely reused and to circulate in safe and healthy flows for humans and nature. In this way, everything can be dismantled and reintroduced into the same cycle or used for a new design. 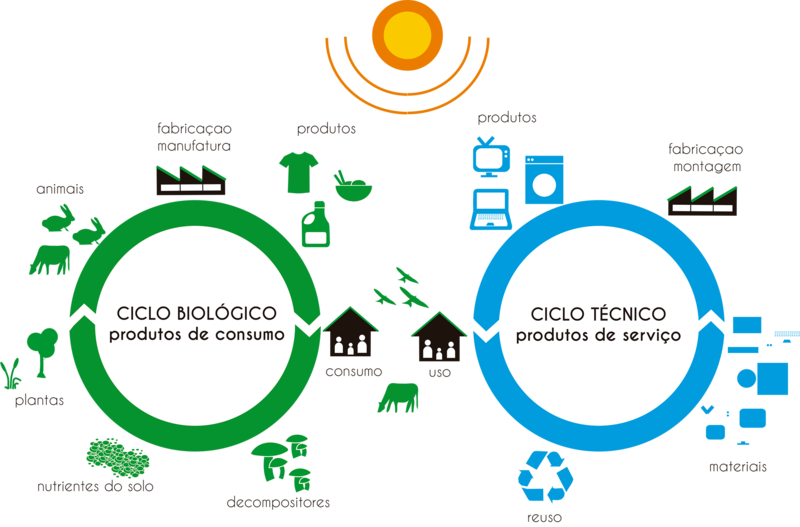 On a larger scale, the application of Cradle to Cradle® becomes the methodological basis for the implementation of Circular Economy. If products, factories and cities are created intelligently, it is not necessary to think in terms of waste or contamination. This concept of integrated design goes beyond sustainability and proposes a future of abundance, rather than scarcity. We believe that to build is to intentionally transform nature – and buildings and cities are products of this transformation. A ‘living architecture’, as we propose, (arquitetura viva) understands nature’s functioning and mimics it to our systems, products and processes. We look towards projects that are adaptable and evolve throughout time. Therefore, we apply the three Cradle to Cradle® tenets in our projects: ‘waste equals food’, ‘use current solar income’ and ‘celebrate diversity’. So we develop healthy buildings and spaces: that have abundant natural light and fresh air, that capture and reuse water and nutrients – since these are precious resources. These buildings are oriented and fed by Sun, and use abundant renewable energy. They are designed to promote community life and connectivity. Materials and systems should be free of toxic substances (mutagenic, carcinogenic or disruptive) and those that have positive effects for the environment should be prioritized. A building or a constructed area inspired by Cradle to Cradle® is also understood as a material bank, where every material is valuable, and should be recovered when its use is not necessary anymore. For that, a building should be designed to be dismantled, and its materials recyclable. Flock is an official Brazilian representative of EPEA GmbH – the agency founded by Prof. Michael Braungart, co-creator of Cradle to Cradle® concept.